Reagan had a really great day today! This morning she was making some strange sounds in her sleep that made us worry that she might not wake up in the best mood...boy were we wrong! She woke up sweet and smiley and just perfect! 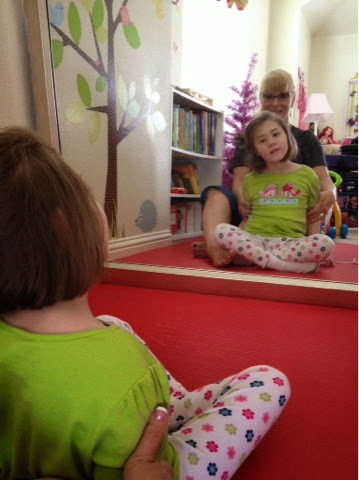 She had speech and OT this morning and did great with both. 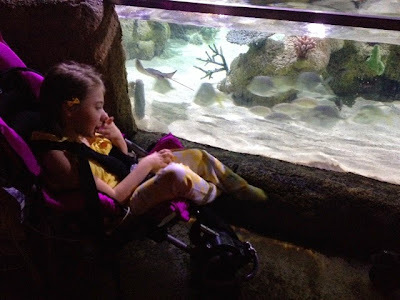 Then this afternoon she was so wonderful, we decided to make a quick impromptu trip to the Aquarium! This was our first trip since school let out and while it was busier than usual, it still wasn't bad. Reagan and Ryan both seemed to enjoy our outing (although Ryan still whimpered as we passed by his old school...twice)! Tonight Ryan went swimming with Daddy while Reagan and I chilled inside. Poor girl, she's got a huge mosquito bite on her arm! Not sure where it came from...it may have been from the other night when I took her swimming or one may have gotten into the house to get her...who knows (but it looks terrible)! After brother went to bed, Reagan and I had some good snuggle time, although we did notice that she seemed to be sensitive to us talking (she got tears in her eyes several times, but never actually cried). Then when Daddy tried to put her to bed tonight, she was just NOT having it. Lots of craziness. She wasn't crying, just vocalizing in an agitated sort of way! Finally we just moved her to her chair and she fell asleep in less than a minute! Poor thing. Sometimes she just needs more support. Hopefully she's able to sleep tonight. Not sure what this craziness was about tonight after such a laid back wonderful day!?!?! Reagan slept well last night, despite being a little more restless than previous nights (kept kicking her covers off). She woke up in a good mood and she's had a pretty laid back day (that is, if you don't count another large liquidy diaper requiring yet another immediate bath). Not super smiley, no real laughs, but calm and collected (with the occasional vocalization). Big wide eyes. Just plain precious. Ryan had a good day too. 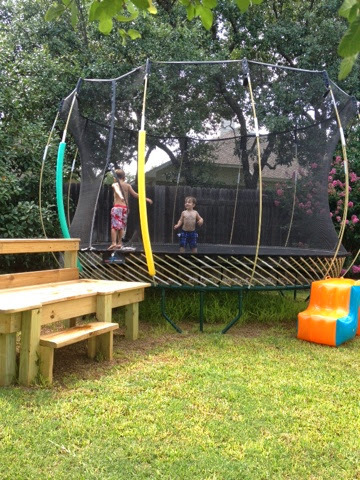 He went over to our neighbor's house and played in their sprinkler/baby pool with their youngest boy (4yrs) and then went over to our neighborhood pool with our neighbor's boys and their cousins. He did surprisingly well. No hitting, no tantrums...I was very impressed! Needless to say, he was big time worn out when he got home, but still resisting sleep! Reagan was a good girl tonight. Very sweet and content. She did get a little spitty/chokey when I tried to pick her up and hold her. 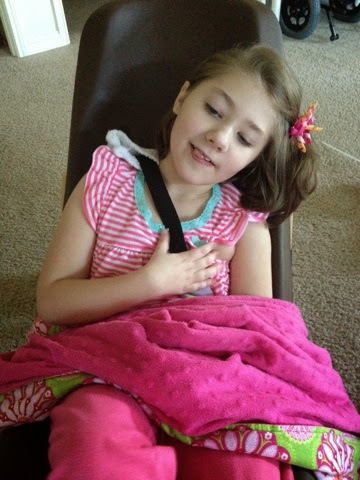 Eventually I had to just put her back in her chair to get her more upright and the choking stopped. 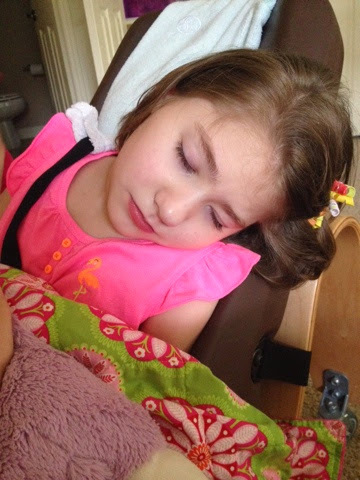 She didn't doze off on her own, but about an hour after a dose of clonidine, she finally closed her eyes! Such a sweetie! Hoping for a great week for my girl! Reagan slept well last night and woke up this morning feeling a little kooky! She's been full of crazy laughs and squeals all day today. We did have a little excitement this morning, while swinging on her swing with her nurse Reagan had a huge blow out that required an immediate bath! It's all or nothing with this girl! She had gone a full week without anything and then today she had two! 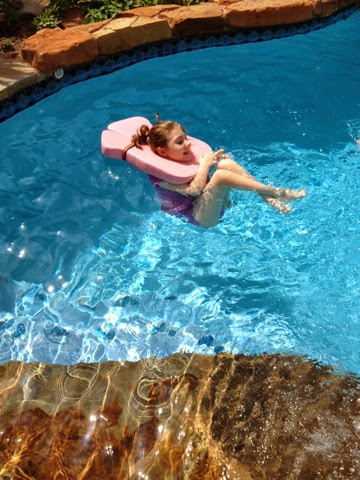 I wasn't sure how she'd tolerate it, but this afternoon I decided to take her in the pool. It wasn't super sunny like the time before, so I thought she might enjoy it more (and not have to squint the whole time). At first she was quite startled and I thought we might have to take her out, but she settled down after a while (although I still think she preferred to be held rather than just float around on her own). 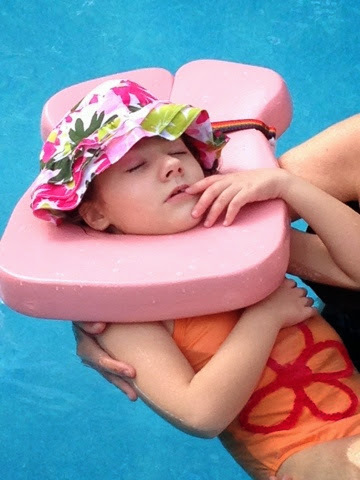 I was a little worried that she may relax too much and we'd end up with an "accident" in the pool...that never happened though so crisis averted! 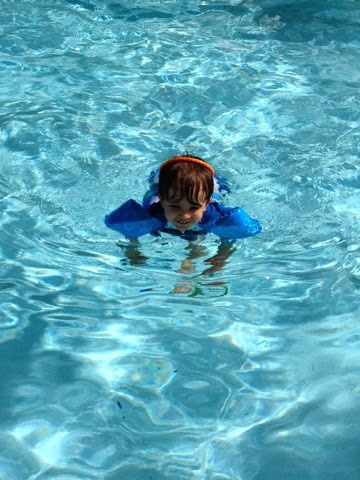 Hopefully we'll be able to get her into the pool again this week...maybe on a day when she's a little less excitable! Tonight she was definitely worn out and dozed off early again! Such a sweet girl! She was out COLD when Daddy laid her in bed tonight! Reagan had a super sleepy day today! She slept like a rock last night and woke up around 9am. She was crunchy and a little serious/tense...not at all what I would have like to see after a sleepy day. But apparently she had more sleep to catch up on because around 10:45 she dozed back off and slept most of the day! Finally around 4:15pm she woke back up and was a little more laid back, but still a little tense. We brought her downstairs and she wasn't sensitive at all (her brother is always a good gauge of that...since he's alway whining or yelling about something). While he and Daddy went for a late swim, Reagan (with my help) finally had a big poo (again it's been days), and afterward she got very sleepy. I definitely think that helped to loosen her up and bit and then she dozed off in my arms. She was in bed by 9, even before her brother (because of his late swim) and I think she's in for another good night's rest! She was laying there with her arms up above her head...that's always a good sign that she's relaxed and going to sleep well! Thankful for some rest for my girl and looking forward to a much needed good weekend for her! Well, I can't say that Reagan slept last night...I actually think she was up most of the night. But she did "sleep" in her bed! I woke up at 2am to cover her back up because she was kicking and rolling around, she was quiet though, so we just let her be. I don't know if she ever went back to sleep. I woke up at 6 and she was wide awake and kicking around. Mike moved her to her chair and she just chilled and watched cartoons. She's been a good girl today. Still a few quirks, a little spitty/chokey and trying to chew on her poor little gnawed up hand (but very good when you take it away from her...she doesn't even fight to get it back). She's been giving us laughs off and on all day today (but not crazy laughs...she only laughs when we make a funny noise or do something to try to get her to laugh). She had OT, PT, and "school" today and did well with everything. She's still a little floppy and didn't want to actively touch the ipad during OT, but she was making great eye contact and did well making choices with her eyegaze. She was looking pretty sleepy (even before school) and she was just SO still...right around 6pm she dozed off and was OUT. Mike and I decided to go on a date night since Bible study was canceled and we already had the nurse staying late and my Dad coming to watch Ryan! We went to Top Golf and had a fun (but expensive) time! I can definitely see how it would be a great place to go with a large group of friends! Reagan slept the entire time we were gone and Ryan was good for Grandpa (he was SO excited to see him) and still wide awake when we got home after 9pm! Reagan was already in her bed and I'm pretty sure she's down for the night! Now if we can just get that boy to stop playing in his bed and go to sleep we'll be set! Reagan had an awful night last night. She kept waking up moaning, you could just tell something was genuinely causing her pain! When she woke up at 5:30am, I decided to just turn the television on for her. That seemed to calm her down a little and she even gave us a few laughs. By the time her nurse got here at 8, she seemed a lot less stressed, sleeping off an on (without medication). The only thing she really hated...diaper changes! She did NOT like being laid down and would get fussy every time she needed to be changed, but other than that, she was actually pretty good. Her body was a lot less tense and stressed today. She'd sit for extended periods of time, completely calm and quiet. She had speech and OT today and did fine with both (although OT said that she was very floppy). She's still very sensitive to sounds, very jumpy and easily startled, and Ryan almost sent her over the edge tonight. Thankfully, I was able to send him outside with Daddy where he blew off some energy in the pool and then came back inside much more quiet! Reagan has still been a little nauseous/spitty and biting on that lower lip (but nowhere near as bad as yesterday). She's still having some temperature regulation issues (sweaty back/ice cold hands and feet), but with her being a little nauseous, putting her on the ground to roll around is not an option! I'm hoping she'll be able to fall asleep and actually sleep in her bed tonight! We'll see. I think we're headed in the right direction...we're just not there yet! Today has been a pretty tough day for my girl. 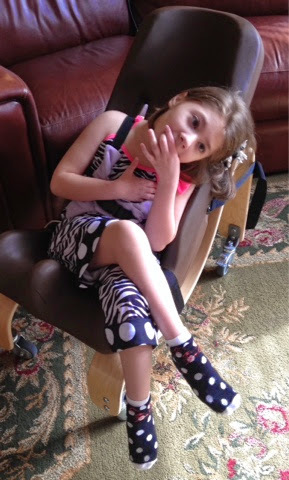 She slept in her chair last night, but I don't think she slept much (she was awake and moaning throughout the night). Her nurse had to give her pain meds off and on all day in an attempt to relieve her discomfort. It helped her to sleep some, but when she was awake, she was pretty miserable and moany. She's crunching in half and making this biting movement with her mouth over and over again (looks like a little vampire). She's also grinding her teeth a lot and biting down on her lower lip (with her top teeth) and then moving them back and forth over and over again. We're worried that she's going to hurt that lower lip, so in order to stop her from doing it, we try to keep a finger on her chin at all times and pull down on her chin to keep her from biting it! 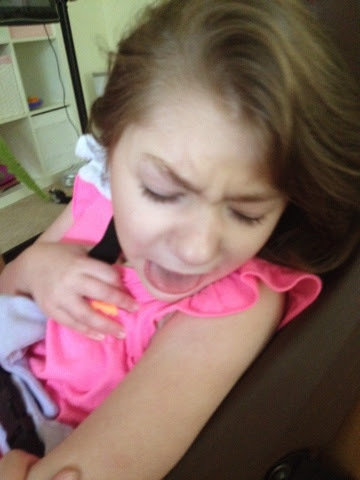 Needless to say, it's impossible to stop her, but at least she's getting some relief from it. We're not sure if she's doing it just because she's in pain (and that's her way of dealing with it), or if it's more nausea related. She's still doing a lot of mouth movements and she did have one random throw up today, so who knows. Tonight she's been a little more fussy/moany (and actually cried a few times, but not for long). Today is day 10 since her last real bad day (so not quite an 11 day cycle but close). Poor thing. Hoping she gets over this quickly and is feeling better soon. Reagan slept OK last night and woke up this morning feeling a little improved. Not as serious, still tense in her body and slightly sensitive, but sweet. She had speech and OT in the morning and actually did pretty well with those (considering). Then this afternoon she just took it easy. 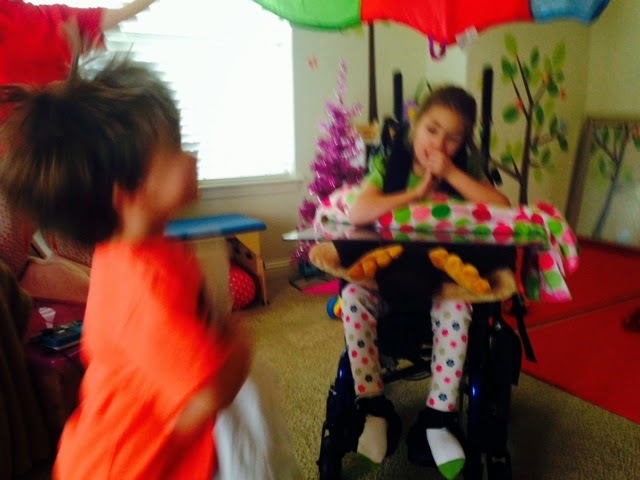 She was a little sensitive to talking and her brother's craziness, but she held it together. Tonight she had a nice relaxing bath and then came downstairs and rolled around on the floor for a bit (she was getting way too sweaty sitting in her chair). Then I picked her up and held her and she really fought going to sleep (even with clonidine). I held her tight and that seemed to help and she eventually dozed off. 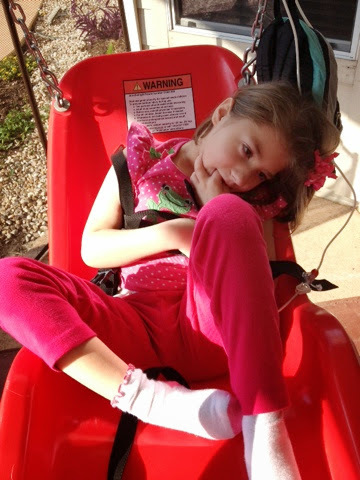 Unfortunately the transfer to her bed didn't go as well, and she started crying and had to be put in her chair. Lortab seemed to settle her down and once all cozied up in her chair, she did finally go to sleep. Not sure what to expect for tomorrow, but I'm going to start the Zofran now. She was definitely doing a lot of mouth movements tonight (smacking her lips and swallowing a lot) right before bed, so I'm not sure if she was nauseous or what. Hoping she is able to get some sleep tonight! Reagan slept well last night and woke up this morning tense and crunchy but OK. She'd give me a hint of a smile, but nothing more. She seemed to do better in her bean bag chair, where she was able to curl up into a little ball. She dozed back off around 10am and then slept and slept and slept until around 4pm! When she woke up, she was even more tense and a little vocal (in the "I'm uncomfortable" sort of way). Her nurse gave her some oxycodone, but it never really seemed to take the edge off (although it didn't make her crazy either, which is good because that's always a risk). She definitely seemed to calm down a little once I got Ryan to bed and was able to pick her up and hold her. I love holding my girl, I hate to think of her ever getting too big for me to hold! She's such a sweetie. Hoping she can get some sleep tonight and praying she'll wake up feeling better despite the odds. Brother the trouble maker! Dumped out a box of cookies and Grandma's dog took full advantage! Reagan slept well last night. Her pump kept kinking and alarming, so that's always fun in the middle of the night. Thankfully, she slept through it! She actually even slept in a little late today. Her nurse is feeling a little something coming on, so she came to work but wore a mask all day! She said Reagan laughed a little when she first saw her, so maybe she finds it amusing. In general, she's been pretty serious today. Not many smiles, hands still in her mouth a lot, and more tense in her body. She did doze off around 10:30am when I was talking to her, but she was still very twitchy. She slept until about 3:30 and she woke up and was biting at her hand a lot and tense. We decided to try her in the pool, thinking maybe it would relax her. It was a little sunny, so she was having a hard time keeping her eyes open...the next thing we knew, she was fast asleep again! She continued sleeping even when we took her out, changed her, and carried her back up to her bed! She's been sleeping ever since! She'll toss and turn and stretch every now and then, but so far she's still out! Hoping she wakes up tomorrow in a good mood (we really have no idea what to expect)! Reagan had another good day today. Slept well, still a little restless. She woke up early again and I found both her and her brother wide awake and watching cartoons by the time I got out of bed! She's been sweet and smiley again today. Very laid back and calm. She had speech today and although she didn't seem interested in using her eyegaze device, she still successfully made choices and even had some tastes of pear & mango baby food! It was a pretty easy going day. Not a lot going on, probably would have been a better day to try our hand at the park...it was even a little cooler (oh well). 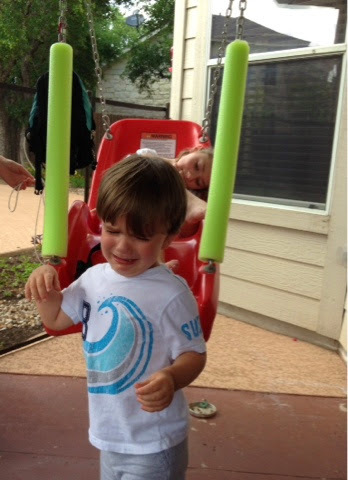 Ryan had a very unsuccessful first and last class at The Little Gym. 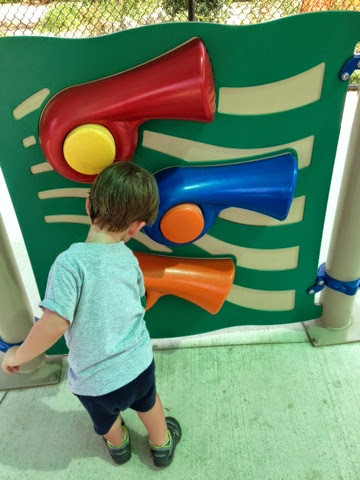 I really hated it (the format was similar to Gymboree, but without the cute/catchy songs and well thought out class) and Ryan was not at all into it...just too much free play and not enough structure! I think I need to see about getting him into an actual gymnastics class. He likes to go and do, he does not like to sit still and wait! 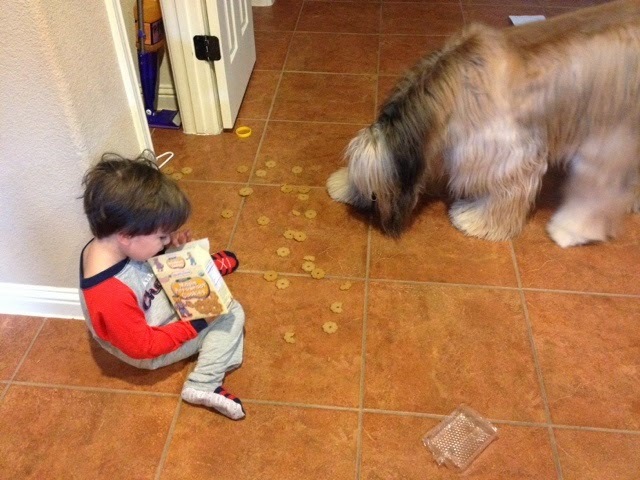 He's definitely got his Daddy's attention span! Tonight Ryan went swimming with Mike and Reagan and I snuggled inside. She's still having a lot of temperature regulation problems, so she does better being held or rolling around on the floor (because she sweats like crazy in her chair)! Tonight she dozed off on her own (in my arms) but she was VERY twitchy and restless and kept popping back awake. Hopefully she's able to sleep tonight, things are definitely a little off, but she's hanging in there! 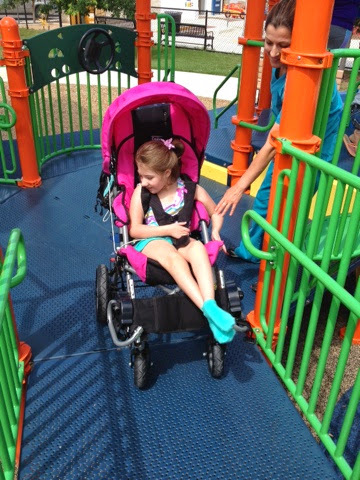 Reagan has had another great day today! She was a little restless last night and I found her this morning squirmed to the end of her bed with all her covers kicked off, but she's been sweet and smiley again so we were ecstatic about that! She has been slightly sensitive to noises (and almost got over excited a couple of times) and her temperature regulation is a bit off, but otherwise, she's been perfect! 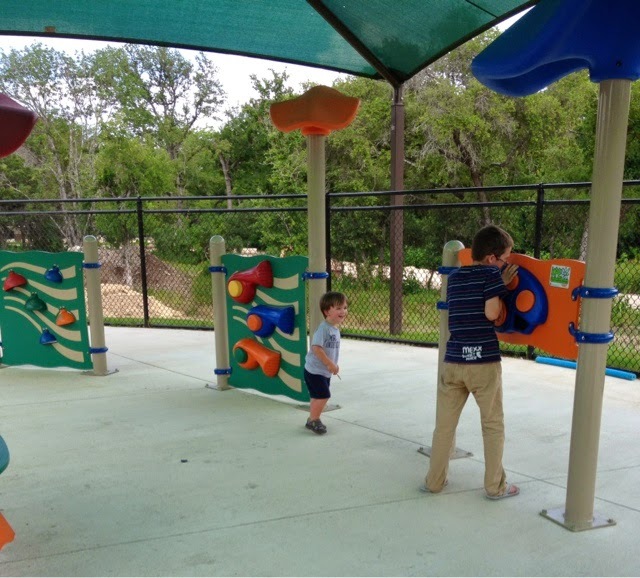 She had a great session of PT and OT again today and then we decided to hit the road and go explore the All Abilities Park in Round Rock (only about 20min away). There was some cloud cover when we left, so I thought it might be the perfect time for us to go, but once we got there it was all sun all the time! We didn't stay super long, but we were there long enough to realize we definitely want to go back! It's very similar to Morgan's Wonderland, obviously to a lesser extent, but there was a lot of the same sort of equipment/set up. 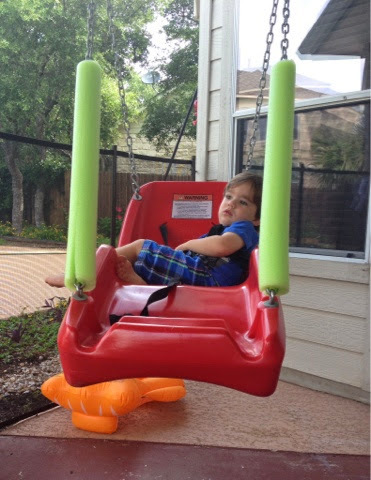 Some neat swings we'll have to try out next time (when it's not smoldering hot)! Ryan enjoyed himself and Reagan had an admirer (and 18yr old girl with special needs) that followed us throughout the park asking constant (repeating) questions about her! It was sweet though, and I think Reagan enjoyed the rock star treatment! We did finally have to leave because Ryan was turning as red as a lobster and Reagan was getting pretty warm herself. We will definitely go back, and often, once it cools down! It was a quiet night with a worn out brother and a sweaty girl! How our day goes is dependent on how Reagan's day is going. Today has been an awesome day for my girl, so needless to say, it was an awesome day for everyone else! She slept well (maybe a little restless but OK) and woke up sweet and smiley. She had an early session of speech, which we began with a little parachute time! Ryan was giddy, Reagan enjoyed it, but not to that extent! Then she had a great session with OT. Lots of floor work (and two more poos today)! Immediately after OT, her teacher came for her first session of ESY. She did great with that as well. 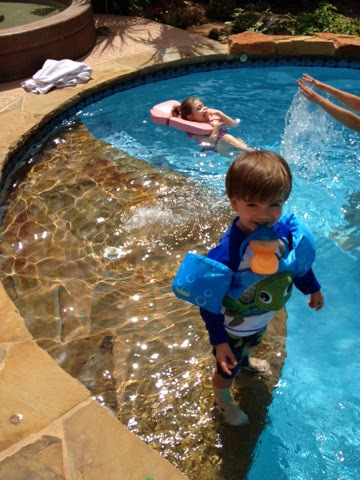 So since it was such a super awesome day, we decided that as soon as her brother woke from his nap, we were going to jump in the pool (Reagan's first time since we moved in and only my second)! Reagan was great! She was a little startled at first, but she did just fine and seemed to enjoy floating around. Ryan, as always, was happy to get in and swim around like a fish (spending most of his time in the deep end making me nervous)! Afterward Reagan lounged a bit under the umbrella and then spent some time in the swing (that is, until her brother kicked her out, cry baby)!! She was great the rest of the night. 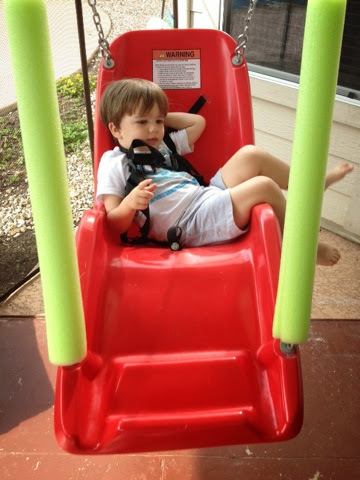 Super sweet and laid back. Very cuddly. Loving these good days for my girl. She was a little restless and fighting sleep tonight, but she did eventually fall asleep with Daddy laying next to her! Love this picture (but there's a speck on the mirror that is right over Reagan's eye)!! Reagan slept well last night and woke up this morning a sweet laughy girl! Finally, I think we're heading in the right direction! She's had a good day today. Her body is A LOT less tense, although she's still kicking around a lot and putting those hands in her mouth nonstop! Less tension, means that we finally got a poo out of her (it had been a full week since her last)! Actually, we got more than we bargained for...FOUR to be exact! I think she must feel SO much better! She had PT this morning and then OT this afternoon and did great with both! Definitely looking forward to a good week for my girl! Ryan was a turkey today, but what's new. I took him in for his ENT follow up and they did another hearing test. Everything looks good. His ears look great. He passed his hearing test (for the most part). He did not tolerate one of the tests (where she had to put an ear plug in his ear, he was OK with his right ear, but was not having it with his more sensitive left ear), but he did fine with the other one where he sits in a room and looks in the direction of the noise. It wasn't perfect, but I guess he did well enough to pass! Afterward we went to my step sister's house and he played with his cousins for a bit! 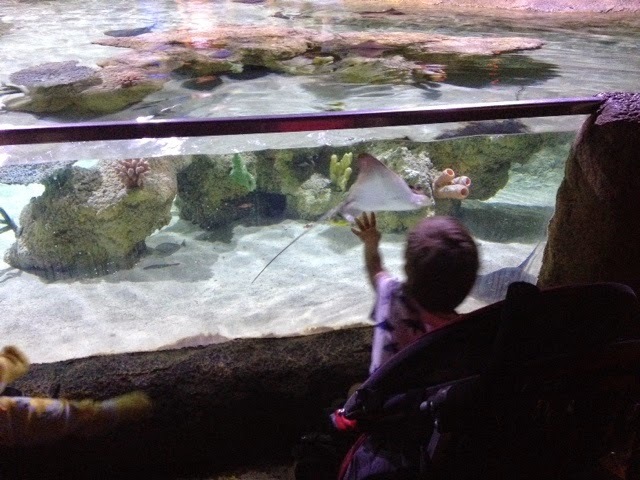 He really enjoyed that...and especially loved their hamster (or as we called it, mouse)! I can definitely see how he'll benefit from just being around them on a more regular basis. He was already repeating things they were saying! Tonight he's been a bit challenging but probably because he missed his nap today (took a tiny 20min one in the car but when I tried to put him down and home he just jumped around like he was on a trampoline)! Hoping every one has a good night's sleep and wakes up happy tomorrow! I think Reagan slept well last night. I never heard a peep out of her, but this morning I found her completely sideways in her bed, so who knows how long she had been up! She was pretty serious and tense today. No smiles, but no tears either. Definitely on edge. And sleepy. She had speech therapy at 11am and just barely made it through awake. She dozed off shortly thereafter and slept the rest of the day. She woke for a brief period around 6:30pm, but dozed back off shortly thereafter. 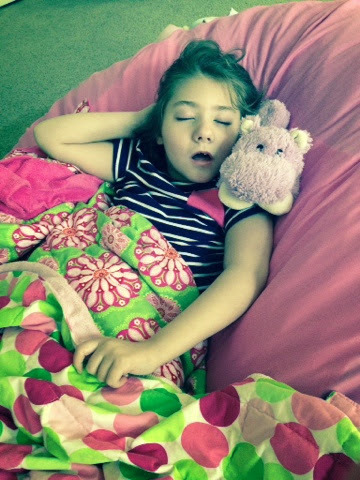 She's asleep in her bed right now and I'm hoping she'll sleep the night through and wake up feeling much improved! Thank you for continuing to keep our girl in your prayers! So today was not the better day we were hoping for! Reagan had an awful night last night, tossing and turning, moaning and crying! It was brutal on all of us! She was miserable...we were miserable! Nothing in our arsenal was working! Finally around 3:20am I gave her a dose of clonidine and she dozed off. Around 5am I heard her fussing and awake again, but she settled down and I think fell back to sleep. I heard her again at 6am, but she was laughing! I thought, maybe we're in the clear?!?! No such luck. She was pretty tense all morning. She eventually escalated to the point of crying and her nurse gave her some oxycodone. That helped her take a nice 1hr nap, and when she woke up she was OK for a few minutes and then the tears started right back up! I went in and was able to distract her for a bit, but you could just tell that something was bothering her. Something was hurting her. Her nurse gave her a dose of clonidine and eventually she did settle down and fall back to sleep. Her body was fighting her though and it was quite a while before she was finally able to shut her eyes and keep them shut. I would definitely call last night and this morning a bad day. I hate seeing my girl like this. It's such a helpless feeling as a parent, because nothing we do really seems to help. Time. Time is the only thing that helps on these days. Hopefully she'll have a quick turn around...especially since these off days have been dragging on and going on for quite sometime now. Tonight she seemed to be feeling much better. She was still chewing on her hand quite a bit and pretty spitty, but she was much more laid back. She even gave me some laughs and little smiles. Maybe this means we're headed in the right direction? Please keep it in your prayers that tonight is a much better night and tomorrow is a better day! We're all ready for good days! 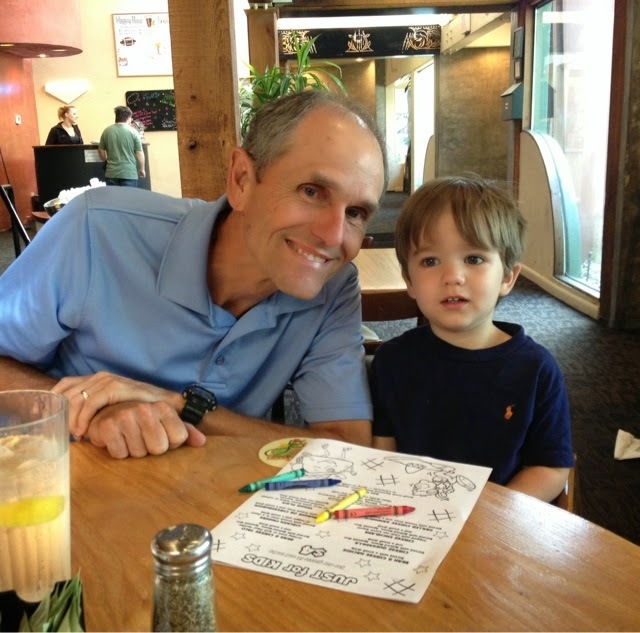 Father's Day lunch with my Dad...Ryan loves his Grandpa! 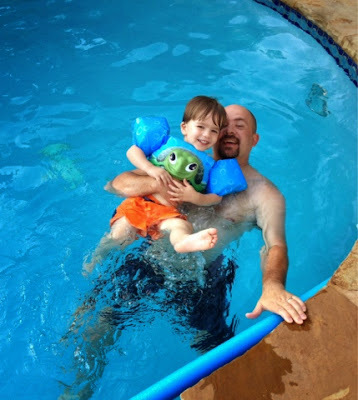 Ryan and Daddy swimming this afternoon! Reagan slept OK last night. She's had an odd sort of day today. In the morning she seemed OK. It seemed like maybe she was turning things around and headed in the right direction. She didn't seem quite as sensitive as previous days. But as the day went on, she was more and more sensitive. 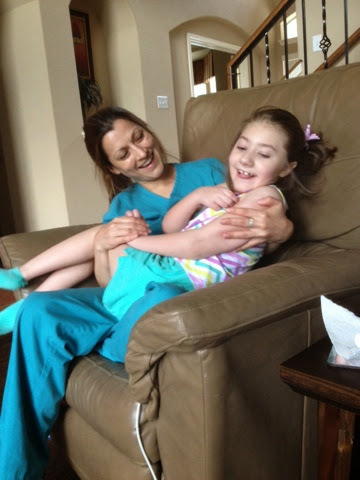 She wanted to be held a lot and when her nurse would put her down or walk away from her chair, she'd get upset. 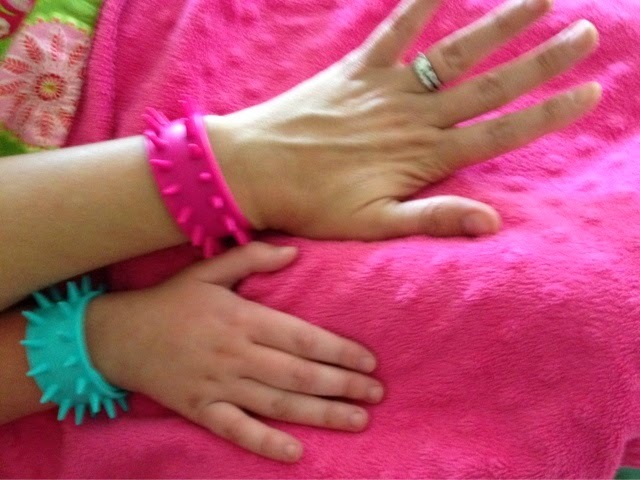 She was crazy into her hand again, and really needed it held at all times (because it seemed she was going to aggresively bite down on it). Her nurse held off all day and managed to get by without any medication, but you could tell she was on the verge of a meltdown all day. As the night went on, it was obvious we were going to have to give her something. I gave her a dose of oxycodone and it had a reciprical effect on her! She definitely got worse! We've noticed that a lot of times, it will make her worse before it makes her better, but not tonight! Just worse! Ugh. I spent the whole night with her upstairs away from her brother and Daddy (who's voice seemed to be setting her off again). Poor girl. I really want her to sleep tonight, but it doesn't look good. Please keep her in your prayers! This was one of her few calm moments tonight! Such a sweetheart! Reagan was a little restless again last night, but she slept. I finally saw her moving around at 7:45am or so, only to go in and find her completely soaked with formula! Her stupid extension popped out again! This particular one just had a way of working itself into the unlocked position and it was getting old (6 days old) and stiff and just popped right out! Thankfully her button replugged itself (so none of that leaked out), but unfortunately when the tube popped out, it landed right next to her head and continued pumping the rest of the night! So her entire head (and hair) was soaked with formula! Needless to say, we immediately bathed her and got her all cleaned up (had to strip down and wash the entire bed)! She was a great sport about it though. Initially when we went in and started talking over her, she freaked out, but she calmed down as soon as Mike picked her up (and we stopped talking). That pretty sums up yesterday. She was very sensitive, specifically to us talking. As long as we were very careful and quiet, she was stable. Still very tense and constantly into her hand. She liked giving me a hard time today...she'd be perfectly fine with her nurse, then I'd come in and talk to her and she'd start getting over excited! Lots of tongue action (and making weird slurpy noises because she was trying to breathe out of her mouth while her tongue was hanging out), but no real nausea to speak of (although she's still on round the clock Zofran)! I'm sick of these off days for my girl, but I guess I shouldn't expect any major improvements on Friday the 13th! Hoping she stabilizes and has a more laid back sort of weekend! Reagan slept OK last night. She was pretty restless and moved around quite a bit, but I think she still managed to get some decent sleep. She's been a little sensitive today. She did OK with PT. 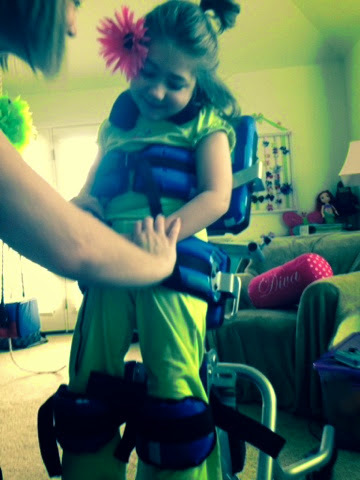 They were able to get her up in the stander for a bit, but she let them know 10min or so later she was DONE! She had OT in the afternoon and freaked out a bit at the beginning (tears and all), her nurse gave a quick dose of oxycodone and she calmed down and finished her session. The rest of the afternoon she just took it easy. She wasn't fussy per say (because she was even smiling off and on), just sensitive. Tonight the sound of Daddy's voice seemed to be a trigger, so I spent my night upstairs with her and Mike stayed downstairs with Ryan. I'm hoping my sweet girl can get some sleep tonight and wake up feeling better in the morning. Reagan slept well last night and woke up a sweet girl again today. She's been a little more tense in her body, lots of crunching, but otherwise OK. She had speech this morning and did well with that. Then this afternoon she and her brother both took very long naps! Hers was especially long and she didn't wake up until just before 6 o'clock! She was even more crunchy to tonight, with lots of tongue action, and just plain off. I decided to go ahead and start the Zofran, just to be on the safe side. I'm hoping she is able to relax and get a good night's sleep tonight! Sorry about the super late post today (I've got to start getting to bed before midnight)! Reagan slept well last night and woke up super sweet and calm as a cucumber today. This morning we ran to the lab early to get some blood drawn for the EPI-743 study and for her endocrinologist. Reagan was perfect and the phlebotomist was great (which is good because they needed a lot of blood)! After we got back she had PT and did great with that. 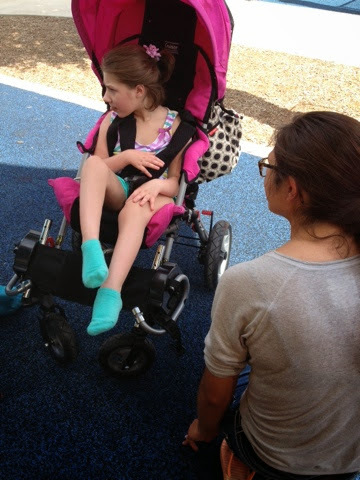 Then this afternoon her OT and the wheelchair guy came out and made a lot of adjustments to her wheelchair. 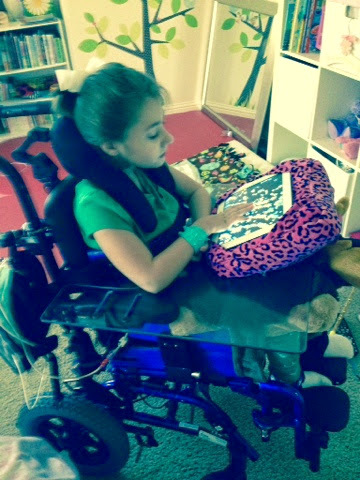 Apparently my girl is growing...and so must her wheelchair. She was SO good for the entire process! All of the talking, getting her in and out of her chair twice, and making lots of adjustments while she was in it...she was such a trooper! 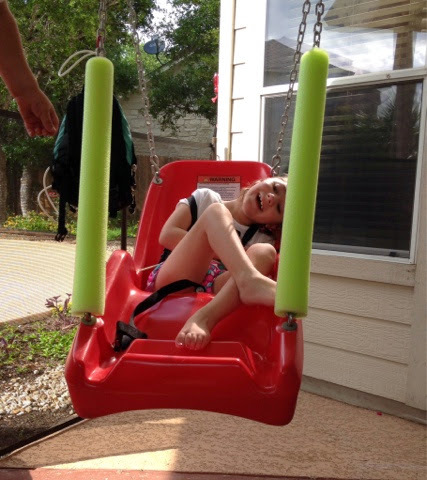 They are going to "grow" her current wheelchair (which is only 2yrs old), which consists of ordering a new seating system, a new padded tray, as well as something to widen her frame. So far she has only been growing length wise, but eventually she'll need that extra width. We also discussed the need for a therapy/changing table and he mentioned the difficulty in getting those approved. Because insurance doesn't care about the caregiver's backs! The problem is, the heavier she gets, the more likelihood that someone will eventually drop her (scary)!! We're going to try our best to get one. We'll see how it goes. Despite giving Reagan a bath this afternoon, tonight I could smell "bad day smell" on her. Her temperature regulation is a bit off too (slightly sweaty back and cold hands and feet). Her last bad day was only 6 days ago, so it's way too soon to be headed in that direction. Please keep it in your prayers that she'll continue having good days. 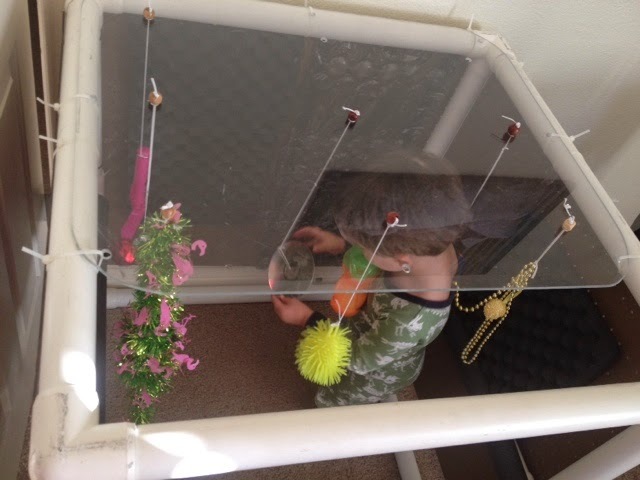 Ryan playing in her "little room". 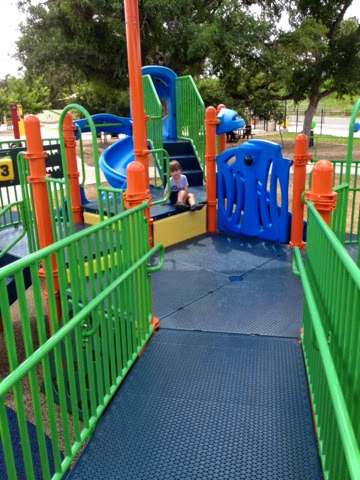 He loves this thing! Reagan slept well last night and woke up this morning feeling great. She had an early session of speech followed by OT and she did well with both of those. We're currently talking to our OT about options for a high/low sort of changing table/therapy table. Right now we all make a lot of transitions on and off the floor with Reagan and it's hurting everyones backs. Reagan's OT threw her back out a month or so ago lifting Reagan, I did it this weekend, and even our new nurse was saying she was having some back pain as well, so this is definitely an issue we need to try to address. At some point we'll also have to look for a lift system and a stair lift (or elevator) if we plan on staying in this house long term, but for now this should help to postpone some of those more expensive, permanent house modifications. Ryan decided to keep things interesting today, and I got a call from his "school' saying that he was hitting and crying a lot today. I went in an hour early to pick him up and basically was told that he had a week to shape up or they were kicking him out! That's right, kicking our 27 month old out of a church based mother's day out! He's a sweet boy but he's still working on getting caught up verbally, so he has the tendency to just reach out and hit when he wants something or gets frustrated. Well, apparently the school has never dealt with a child that does that (yeah right), so it looks like we might be in the market for a new school for him. It's very frustrating because I think he's done really well up to this point, but the teacher that was so great with him is off all summer and I think the remaining teacher (who never seemed to work with him at all) and director just don't want to deal with him. It makes me very upset because he really needs that structure and exposure to other kids, so I have no idea what we're going to do now! Ryan did not get the memo that he was supposed to be our easy child!! No drama from my girl today though. She's been great! Tonight she didn't really seen to enjoy hearing is talk about Ryan drama, and she let us know by getting a little excited, but she'd quiet down as we stopped! She did get a little kooky after her pm dose of clonidine, but settled down as soon as I picked her up and fell asleep in my arms! Such a sweetie!! Reagan had another good day today. She slept well last night and woke up sweet and smiley! Grandma and I spent a good portion of the day reorganizing her closet. 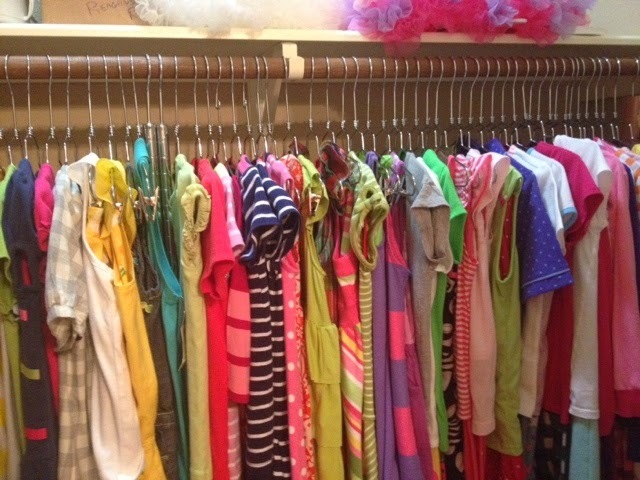 This girl has quite the wardrobe! 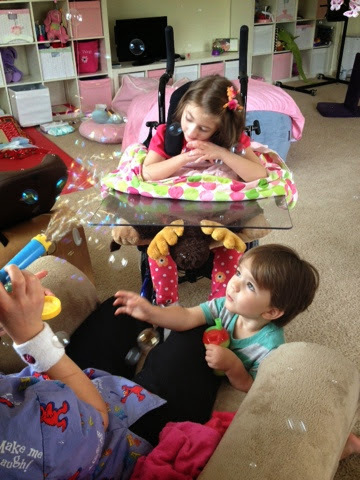 Reagan was having bubble time with her nurse and Ryan wanted to get in on that action! There were bubbles everywhere! 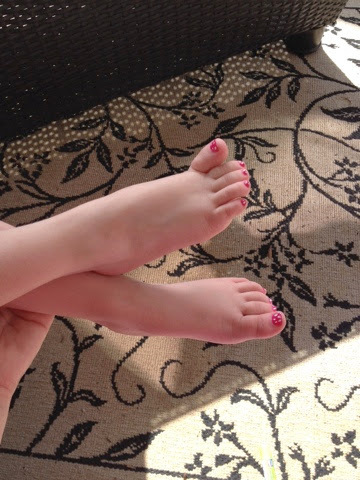 Then Grandma inspired by Pinterest, painted Reagan's toenail pink with white polka dots (although they ended up looking more like watermelon seeds than polka dots)! Then this afternoon we went for a walk and hopefully avoided the mosquitoes that have been plaguing us outside (haven't seen any bites yet)! Tonight I got in some snuggling but then she kept getting spitty/chokey so I had to put her back in her chair to get her more upright. All in all it was a good day for my girl. She was a laughy (without ever getting the crazy laughs) and sweet and just overall laid back! Good times! It's been a pretty good day for my girl. She slept last night but was a little restless. Her pump kept going off (over and over again) because her tubing was kinking. When we went in this morning, we found her completely soaked in formula! Her tube obviously kinked again and the med port popped open this time, so her intestinal fluids leaked out and the pump fed the bed for the remainder of the night! What a mess! She was in good spirits though and after changing her clothes I held her for a bit (obviously in just the right position) and she had a big poo diaper on her own! She was a sweet, smiley girl all day today (even giving us some laughs). Her temperature regulation is back to normal and the only quirk we're noticing is a little spittiness and a lot of tongue action. Tonight she was really fighting sleep (she got a little gaggy at one point)...I carried her up and down the stairs twice and finally on the second trip, she stayed asleep! Hoping for a more restful night's sleep tonight for my girl and another sweet smiley day tomorrow! Thank you for all the prayers! 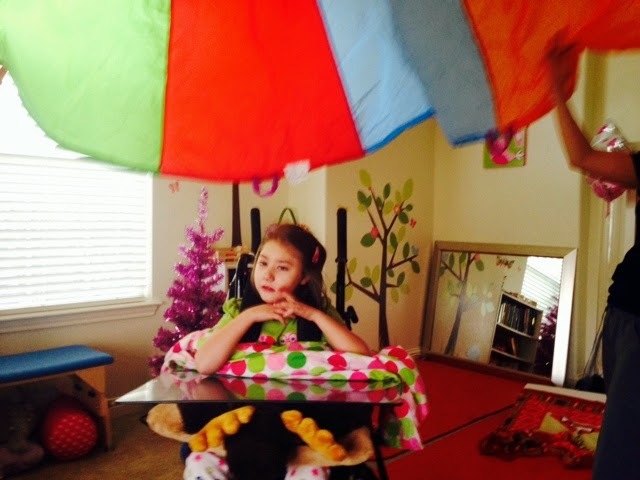 Reagan slept all night last night (in her chair) and woke up feeling much better this morning! When I say much better...I mean MUCH better! Although her body has still been tense, her overall demeanor has been quite relaxed. When awake she's been very calm and quiet, but she's also taken some very long naps today as well. I'm just SO happy to see her feeling better. Tonight she was a little mouthy/spitty, but she dozed off on her own and even though she's still a little restless, she's in her own bed! Hopefully she'll continue to improve as the weekend goes on! Grandma will be here all weekend, so I know she'll be happy about that! I'm having some issues myself today. I noticed a week or so ago that I had a sore throat and pus on my tonsils (similar to Ryan's), I went in and they couldn't find anything (similar to Ryan). Well then a day or two ago I noticed some tenderness to skin behind my left ear. And then today it's spreading down my neck and when I swallow my ear hurts! I have no clue what's going on, but I think I'll head into the Saturday clinic at my Drs office tomorrow morning. I'm just afraid that they won't know what it is. Ryan's been tugging at his ears again this week and I wonder if he's experiencing the same thing! Ugh. I just don't want Reagan to end up with this nonsense! Prayers that whatever it is, it can be resolved quickly and not passed on to my girl! Sooooo, just as I thought. My girl has had a horrible bad day today. The worst we've seen in a really long time! Thankfully last night she slept the whole night through (in her chair), but she woke up crying this morning and has been crying/miserable every waking moment today. On a good note, she has been able to sleep through most of the day, but on a bad note, it was only with the help of medication. 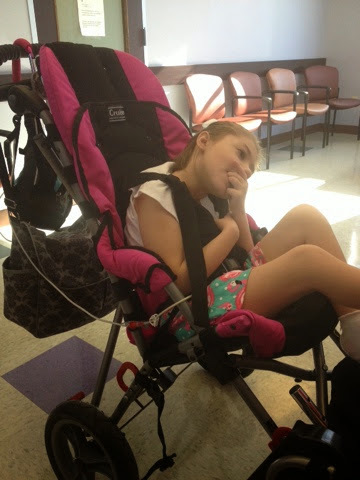 Needless to say, I've made the decision to cancel her procedure scheduled for tomorrow (MRI/ABR). I just don't think it's smart to put her under anesthesia when her body is already under so much stress. It's not worth the risk! Not to mention, these are not tests that we have to have done right this second (which is good because the soonest we could reschedule is more than a month away). So here we are. The bad days are back and in full force, but she did technically go a little longer between cycles this go round (13-15 days instead of the usual 11). I'm hoping today is her only miserable day and that we see dramatic improvement by tomorrow. Grandma is going to be here this weekend and I'd hate for her to miss out on enjoying that because of bad days! I want to take a moment to mention our wonderful nurse (we actually have two really great nurses now)...Megan has been with us since we moved to Austin. She has seen Reagan at her best and at her worst! Today was definitely one of those worse days and it's a lot to handle 10hrs of "bad day"...but she went above and beyond and even stayed late tonight because Mike was running late! She genuinely cares about Reagan and even texts me on the weekend to check in on her! SO thankful to have her! Quick update. Reagan was restless last night. Very squirmy, vocal, and just not sleeping well. She was still smiley this morning, but also very tense in her body. She did well with both speech therapy and school. We stopped the Zofran, but my gut instinct was that we weren't out of the woods just yet. Tonight she got increasingly sensitive and tense, and then had a major freakout about 15min after her dose of clonidine. No idea if it was the clonidine that made her crazy or what, but thankfully a dose of Lortab seemed to counteract the effect. 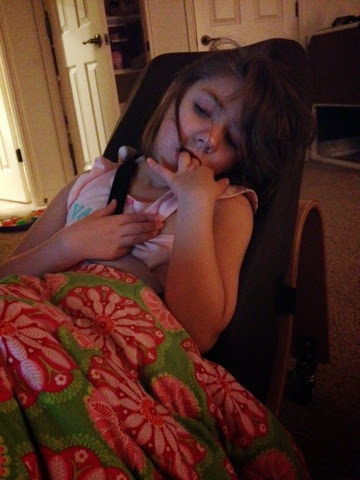 She's sleeping peacefully in her chair (with her arm restrained). Hopefully this was just a fluke and she'll sleep all night and wake up tomorrow feeling fine...please keep her in your prayers. 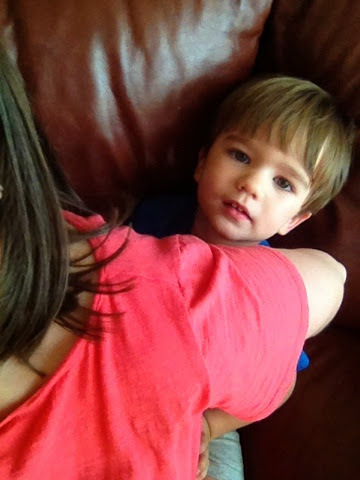 This boy...always attached to me! 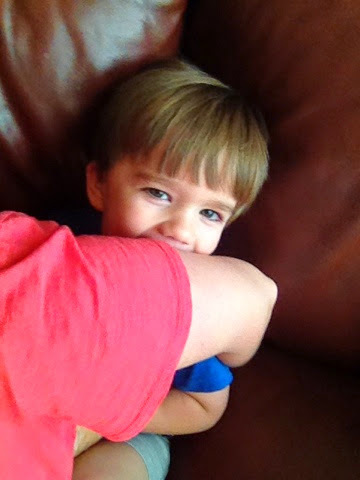 Teething but sweet (except for the biting)! Reagan slept well last night and woke up feeling a little better today. She was still tense, but not nearly as sensitive. Temperature regulation is definitely worse, but otherwise she's had a pretty good day. 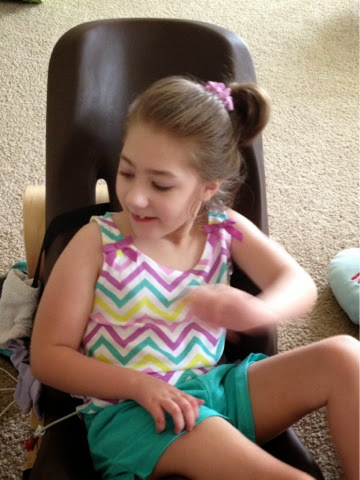 She did really well with speech, PT, and OT (and even did a great job using her eye gaze)! She did accidentally bite her nurse on the shoulder...but her hands were restrained and she went for the nearest thing (we actually think she thought it was her hand)! She's also teething! I first noticed a few days ago, but her nurse noticed last week...she's finally getting those two top lateral incisors in (she lost them at least a year and a half ago)! One has already broken through and the other one is just under the gums...maybe that's why she keeps sticking her tongue out?!?! Hopefully they'll come in and push her two front teeth back together! Because of her mouthiness, we did try to keep her left hand away from her most of the day...she's a fighter though and kept getting it away from us! 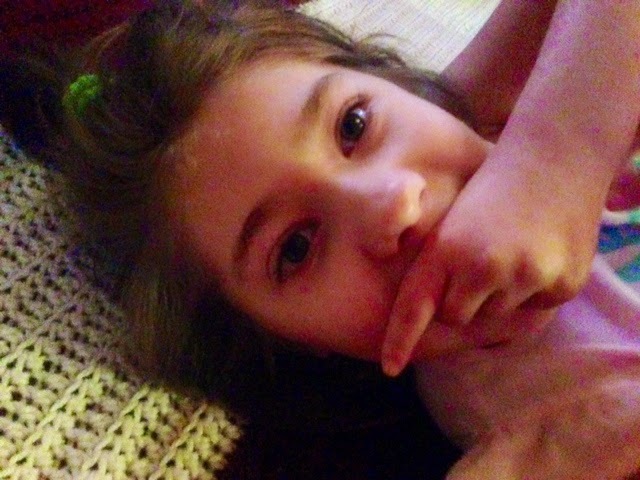 Her brother busted his lip tonight on the baby gate. He likes to jump/bounce up and down when he's excited, well he got a little too close to the gate and ended up with a bloody lip! He's a tough guy though and by the time it stopped bleeding, he had already forgotten about it! Never a dull moment over here! We still really have no clue what to expect with Reagan (and her good/bad days). Praying that she's on the upswing of things and that she's able to get her MRI/ABR on Friday! 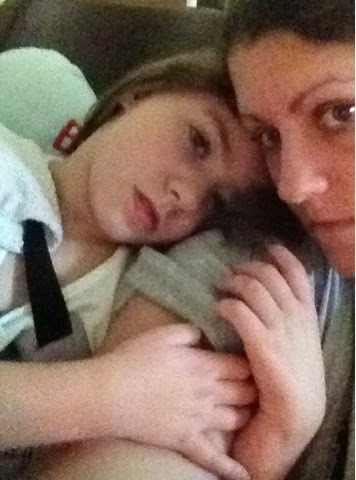 Reagan slept well last night but woke up very tense and sensitive today. She's been OK, we've just had to be super careful with her to prevent a total meltdown. Her OT came this morning and she was not at all interested in her eye gaze device. In fact, she did very well at telling her so by looking away and refusing to look at it altogether! I'd say that's communication! 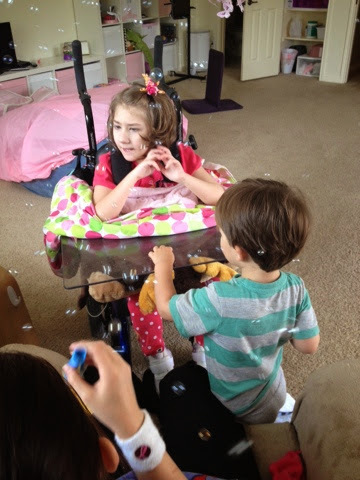 She almost lost it when she heard her brother crying downstairs, but she was able to distract her and prevent it. She was very tense throughout the day and very much on edge, but still giving us smiles (that is, when her hand wasn't jammed down her throat)! Her nurse actually had to keep her hand away from her most of the day because she was getting close to the point of biting, a few times she ended up with tooth marks, so we wanted to prevent any real injury. This afternoon her teacher came and she did well for the most part. Toward the end, her teacher broke out a noisy toy (despite warning her of Reagan's sensitivity) and Reagan just about lost it! She got as close to crying (without out actually crying) as she could get and her teacher decided to just wrap it up! Thankfully she recovered and was actually fairly calm the rest of the night. Still trying to get at her hand, still easily excitable (I had to be careful as to what came on tv), but stable and even smiley. I'm still not sure if she's headed toward good or bad days! Hoping she's able to get some sleep tonight, as she's still a bit restless! 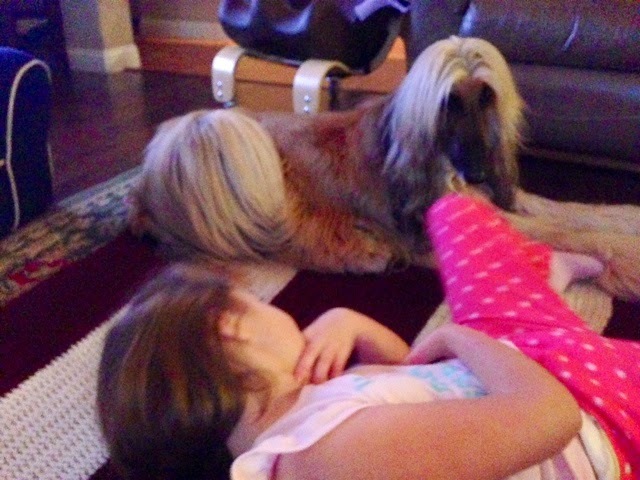 Reagan slept well last night and woke up a sweet girl, but with a slight bit of tension. It was something we noticed all day. She was just a little more tense in her body, a little more sensitive to certain activities or noises, definitely trending in the wrong direction. Her hands and feet were clammy but not cold (and no other temperature issues). 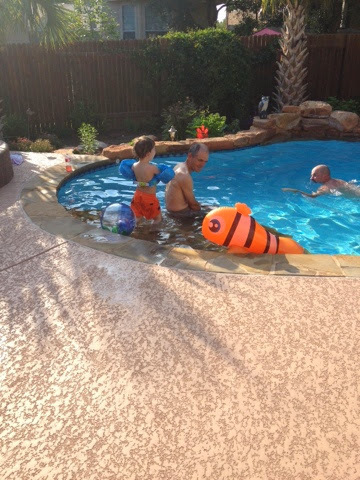 Grandpa came over this afternoon and Mike and Ryan went swimming with him while I pushed Reagan in the swing. It was a little warm (and still lots of mosquitoes) so we didn't stay out long. Tonight she was crazy into her hand and escalating in her kookiness. I gave her a dose of oxycodone to settle her down, but it took a while to work and even when it did, she still needed to be held to fully calm down. Finally about 15min after her pm dose of clonidine she dozed off. Hoping she sleeps tonight and just to be safe we're going to start the round the clock Zofran. It's hard because the last cycle didn't follow the usual 11 day cycle, so now we really don't know what to expect (but we can see it in her body that she's heading the wrong direction). Hopefully she'll have a short go of it this time around...she's scheduled for an ABR/MRI for Friday...I really don't want to have to reschedule it again!